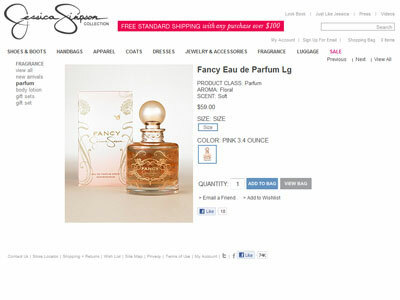 Fancy Perfume by Jessica Simpson. Her first celebrity fragrance with Parlux launched in 2008. Available in 50ml and 100ml Eau de Parfum and Body Lotion. Inspired by the many layers of Jessica Simpson's award winning talent, beauty and captivating personality, FANCY Jessica Simpson is a sensual fragrance that is feminine, versatile and memorable. It's red carpet ready while maintaining the subtle flirtatious charm of the enticing girl next door.